Baseball season is officially back and I couldn't be happier. Baseball ranks up there with football as sports I'm truly passionate about. While there are many people who don't find sitting through nine innings thrilling, it is one of the classic American sports that I've loved to watch since I was a kid. My dad would watch baseball with a bottle of (Asian) beer with foam that made me think it was soda (until my dad let me try some of the beer foam and I immediately understood otherwise). It made me feel like a guy's gal when I watched sports with him. Now, I watch sports with my husband and while we sometimes root for different teams (he is from LA after all) we are on the same page with how much we cheer on our team. cutie! 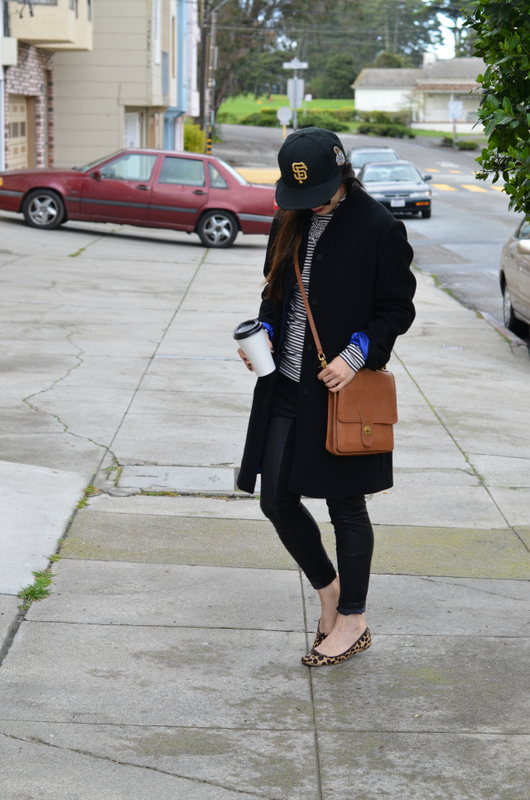 love how you stuck with classic pieces here that feel super girly, but successfully mixed in some sporty accents, too. love! LOVE LOVE this color combo! I love how the royal blue is peeking thru! Love the hat! it takes the outfit to the next level! Bloggers have been talking about their favorite teams! I love this outfit Nancy. Great bag and shoes too! I didn't know you were such a baseball fan, Nancy! My bf is a huge Royals fan (he's from Kansas City), and although I'm not much of a fan, as a kid, I have the best memories of our family outings to the college baseball games! 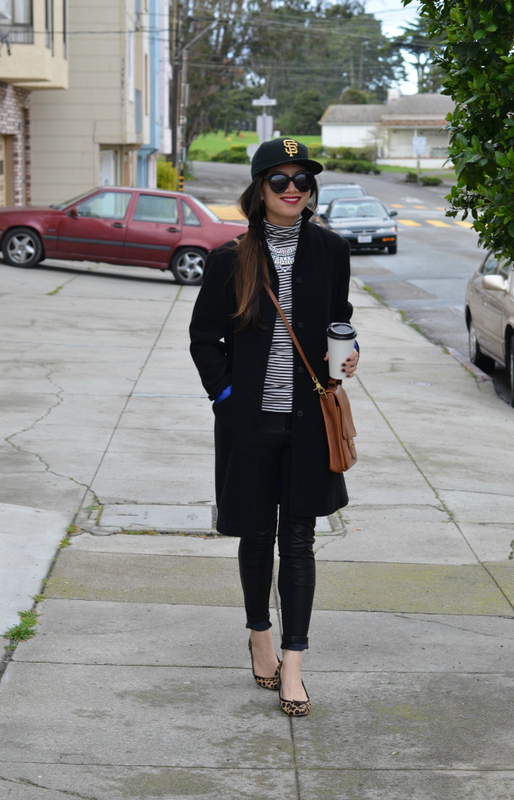 Love this outfit, esp pairing that striped turtleneck with the coat + sports hat!! I love this stylish yet tomboy look. My father made me a baseball fan as well; we all root for the Rockies. Seriously, you mix fancy and easy pieces together so effortlessly! I love your leopard heels and the bling necklace! So gorgeous! I love the stripes with the baseball cap and how you glammed up the outfit with the necklace. I adore the addition of the baseball cap to this. It's totally urban and chic. i love baseball season too. used to love the braves from the early nineties and the mets since the eighties :) when i moved to la i went to see the dodgers play the mets and i was probably the only person in the stadium rooting for the new york team. then someone told me to go back to new york lol. girl, i always LOVE your classic style! cool hat!! i don't know how you did it, but you made a baseball hat look chic! i put one on, and i look like a soccer mom tom boy, lol. i really, really, love this look! I love the stripes and leopard, so pretty!